Le Boudoir Darien CT Salon located at 13 Grove St, Darien, CT should be on your to go list and for so many reasons. Mamoune Tazi, the Moroccan born founder and stylist, spent years working in traditional salons and blow out bars before creating Le Boudoir. Mamoune had a passion for making women feel beautiful, inside and out, and felt this was missing from the beauty industry. He realized a woman has many choices for getting her hair and makeup done. None of these choices delivered a personal, luxurious experience where women could leave feeling beautiful and confident. Mamoune’s years studying in France provided the inspiration for dreaming up a private space for woman. By fusing traditional blow out bar concepts with makeup services and philanthropy, Mamoune’s American boudoir came to life. Le Boudoir Darien CT is devoted to our community. Through our Beauty2Charity program, we donate $1 from each full-priced service to a local, non-profit organization. We encourage you to become a part of our philanthropic efforts by recommending non-profits that are important to you. We take pride in the communities we are involved in, and with your help, we can ensure our presence helps create a positive impact for the future. We invite you to escape the hectic routine that is your life. We know that nothing is more valuable than your time. 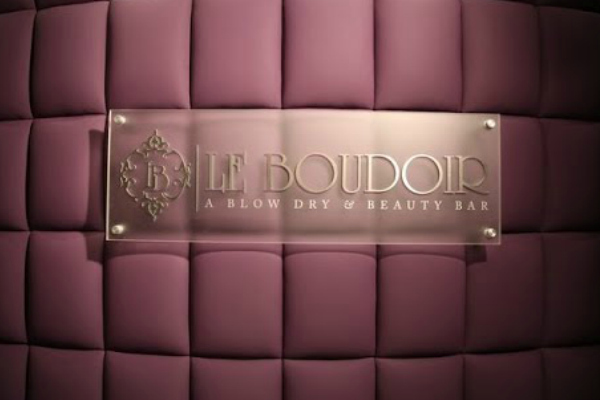 Le Boudoir delivers luxurious beauty experiences at our salon or in the comfort of your home. Our hair and beauty artisans are at your service any time, any place, armed with every tool and product necessary to quickly beautify your day. A blow out before work or an updo and makeup before the gala, we’re just a phone call away.